What type of car to go with? Used cars can be a more economical way to replace a vehicle – buyers can get a vehicle that’s almost as good as new, without having to deal with the depreciation that’s associated with buying new. For those who decide to go with purchasing a used car, there are many more things to consider. Research vehicles with a good resale value. 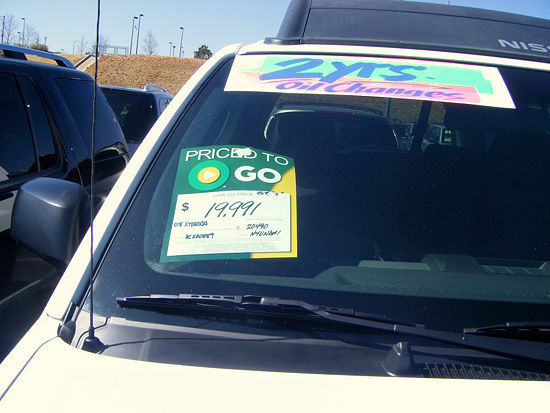 Vehicles that have a good resale value tend to make good used cars. Cars like the Nissan Altima, the Toyota Camry and the Honda Accord tend to hold their value and remain on the road longer. In addition, used vehicles from second-tier auto manufacturers like Mitsubishi and Mazda are comparable, and on average, $3,000 cheaper (source: edmunds.com). Shop for newer used cars that still have some of their original manufacturer’s warranty. Most late-model vehicles have at least 3-year/36,000 mile warranties, while newer used vehicles may have 10-year/100,000 mile warranties. Take advantage of the maintenance included with these vehicles. Also, be sure to verify that the warranty is fully transferable. Research the vehicle’s history. Details concerning past owners, use and maintenance should be important in influencing your decision to buy a used vehicle. Companies like Carfax and AutoCheck provide buyers with vehicle history reports that cover title information, flood damage history, total loss accident history, odometer reading, and more. Be sure that the vehicle you’re interested in will pass both state safety and emissions tests. In most states this is a legal requirement, but not in all. Be sure to check with your state vehicle administration office to verify if these tests are required before the sale of used vehicles. Repairs to make a used car roadworthy could cost hundreds of dollars (if not more) and in most states, you can’t register your vehicle if it does not pass these tests. Consider Certified, Pre-Owned (CPO) Vehicles. These vehicles are typically late models with more than 50,000 miles, but have been through multipoint inspections, with any needed service or upkeep taken care of before they are put on a lot. CPO vehicles are also backed by the manufacturer and often come with extended warranties at no additional cost. Examine the vehicle services record and mileage disclosure documents carefully. Verify that the vehicle has been well-maintained and regularly serviced. Things like oil changes and radiator flushes help to preserve the integrity of the vehicle’s engine and keep it on the road. Test drive the vehicle before you purchase it. During the test drive, be sure and check for things such as: acceleration from a stop, visibility, engine noise, passing acceleration, hill-climbing power, braking, cornering and turn radius, suspension, and rattles & squeaks. All of these things must be considered before the purchase. Compare the value of the vehicle with the sale price using the NADA Official Used Car Guide published by the National Automobile Dealer Association or the Kelley Blue Book. Also compare prices of similar models and years to verify that you are not paying too much. Ask about the dealer’s return policy and get it in writing. Be sure to read through it carefully – many times there are mileage and time restrictions involved in returning a vehicle. Carmax, for example, offers a 5-day money-back guarantee if the vehicle is returned in the condition it was purchased. Check for any manufacturer recalls for the make, model and year of the vehicle you are interested in purchasing and ensure that all recalled items have been addressed on the vehicle. The manufacturer recalls involve both the safety of the vehicle and the passengers within and should not be overlooked. These are just a few of the considerations buyers might want to think about before buying a used vehicle and some more great information can be found online. As always, we welcome your feedback! If you have any additional tips to buying used vehicles, please leave us your comments below! The idea of buying a certified pre-owned vehicle isn’t a new one – in fact, according to a study conducted by J.D. Power and Associates, sales of certified pre-owned (also known as certified used) vehicles increased by 46% over the ten-year period 2000-2009. Have you ever wondered what the difference is between a certified pre-owned vehicle and a standard used vehicle? That’s the topic of our discussion today! To qualify as a “Certified Pre-Owned” vehicle, a car must be offered for sale with a warranty that extends beyond the life of the initial new car coverage, and the warranty is backed by the original manufacturer. Only certain used cars will make it into the certification program. Two standard requirements are 1) the car is less than five years old and has fewer than 75,000 miles and 2) the vehicle must not have had any serious accidents that would have required extensive bodywork. Obviously, there are some pretty strong advantages to buying a certified pre-owned vehicle, like our certified Pre-owned Acuras and Nissans here at Tischer Auto, and we’re going to fill you in on them right here. 1. Extensive safety and performance inspection. This is a huge benefit when buying a vehicle that someone else has owned because hidden problems or concerns could be revealed during this inspection. This inspection (typically at least 100-points) should start with major operating systems – like the engine, transmission and drive train – and should also include aesthetic elements of the exterior and interior, as well as the functionality of safety features on and in the vehicle. Once the inspection is complete and the vehicle is qualified for the manufacturer’s certified program, the vehicle is repaired and/or refurbished to bring it to nearly new-car standards. This extensive detailing and repair will make any used vehicle seem like new again! As we mentioned above, a certified pre-owned vehicle is one that comes with a manufacturer’s warranty that extends beyond that of the original warranty when the car was new. In some cases, these extended warranties may even kick in after the original factory warranty expires (if the original was transferable). This factor alone most definitely adds a sense of security to your decision to purchase a used vehicle. Perks such as loaner cars, shuttle pick-up and drop-off service, roadside assistance, and free maintenance, are typically reserved for new car customers, but are generally included when purchasing a certified pre-owned vehicle. For these benefits alone, it’s worth the time and effort to look into a certified pre-owned vehicle the next time you’re in the market for a car. The reality of buying a used car is that you get what you pay for, so the investment in a certified pre-owned vehicle is definitely worth it in our opinion. Have you looked into or perhaps purchased a Certified Pre-Owned vehicle? Tell us about your experience in the comments section below. We value your opinion!